(TORONTO – May 9, 2012) Reliving the early days of Canadian rail travel, artist Aimée Henny Brown, in partnership with the Art Gallery of Ontario (AGO), OCAD University and VIA Rail, presents Overland Station: par voie de terre. This site-specific and interactive performance will stop at the AGO on May 17 at 6:30 p.m. for a free public performance, celebrating the mid-point of Brown's eight-day trip across Western Canada. 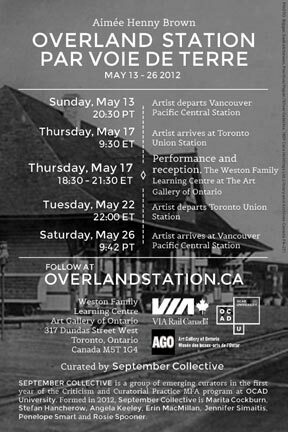 Overland Station: par voie de terre begins on May 13 with an impromptu performance at Vancouver Central Station, and continues as the artist travels aboard the long haul passenger train, The Canadian, enroute to Toronto and back. Performing for passengers twice a day in the VIA Rail Activities car, Brown will bring the past alive through her portrayal of a station agent from the turn of the century. Wearing a historically inspired uniform, Brown will complete many of the duties assigned to a station agent in the late 19 century, including sending and delivering telegrams and letters, and distributing handmade letterpress tickets. “VIA Rail is delighted to promote some of Canada's most talented artists across a broad spectrum of genres. This partnership with the Art Gallery of Ontario and OCAD University is a great addition to the magic and appeal of VIA's renowned Canadian,” said Geneviève Beland, manager for VIA's on board entertainment program. “Through this initiative, our passengers' travel experience will be enriched, both culturally and historically, throughout their entire trip across the country." As a performance artist invested in social histories and public engagement, Brown’s goal is to inspire conversation about the various individuals and personal stories that underlie passenger rail lines like The Canadian. More than a mere contiguous line of track, it was individuals, station agents in particular, who made cross-country travel, commerce and dialogue possible. In addition to her performance as a station agent, Brown will update and post coverage of her project as it progresses online at overlandstation.ca. There the public can view her performances and discover images and research related to the early days of Canadian train travel. On May 17 in Toronto, Brown will make a stop at the AGO’s Weston Family Learning Centre for a free public reception. Throughout the evening she will perform in character from within her portable ‘pop-up’ train station, distributing handmade materials, sending messages, collecting post and sharing her experiences with the public. The curators (the September Collective) of the project will be available to answer questions and to give their remarks on the project. Following this event, Brown will repack her luggage and retrace her route back to Vancouver aboard The Canadian. Overland Station: par voie de terre is curated by September Collective, a group of emerging curators in their first year of the Criticism and Curatorial Practice MFA program at OCAD University. A publication designed by Daniel Espeset will be released in 2012 and will be available to download from overlandstation.ca and ocadu.ca. Midway through her round-trip journey, members of the public are invited to a free performance and discussion with the artist Aimée Henny Brown about her interactive installation Overland Station: par voie de terre. Throughout the evening, participants will be invited to engage with the artist as she re-enacts the role of a station agent from a specially designed "pop-up" train station and will have the chance to send letters, dictate Morse code messages and receive hand-printed tickets. Born and raised in Western Canada, Aimée Henny Brown completed her undergraduate degree in Fine Arts at the University of Alberta. After moving to Halifax, Nova Scotia, in 2005, she obtained her Masters in Fine and Media Arts at NSCAD University in 2007. Brown’s artistic practice engages archives and research to place historical content within contemporary performance and visual art. She has received several awards and grants, notably the Joseph Beuys Scholarship for Artistic Merit, a Canada Council Creation Grant, and an honourable mention at the 2011 Halifax Contemporary Visual Art Awards. Brown has exhibited her work nationally and internationally, with group shows in Germany and Los Angeles, and has completed several artist residencies in North America, most recently a five-month residency with Point Pleasant Park in Halifax, Nova Scotia, and a year-long artist-in-residence program with Emily Carr University of Art and Design in Vancouver, British Columbia. September Collective is a group of emerging curators in the first year of the Criticism and Curatorial Practice MFA program at OCAD University. Formed in 2012, September Collective is Marita Cockburn, Stefan Hancherow, Angela Keeley, Erin MacMillan, Jennifer Simaitis, Penelope Smart and Rosie Spooner. OCAD University (www.ocadu.ca) is Canada’s “university of imagination.” The university, founded in 1876, is dedicated to art and design education, practice and research and to knowledge and invention across a wide range of disciplines. OCAD University is building on its traditional, studio-based strengths, adding new approaches to learning that champion cross-disciplinary practice, collaboration and the integration of emerging technologies. In the Age of Imagination, OCAD University community members will be uniquely qualified to act as catalysts for the next advances in culture, technology and quality of life for all Canadians. VIA Rail Canada operates the national passenger rail service on behalf of the Government of Canada. An independent Crown Corporation established in 1977, VIA Rail Canada's (http://www.viarail.ca/) mandate is to provide safe, efficient, more environmentally sustainable and cost effective passenger transportation, in the country's two official languages. Every week, VIA operates 503 intercity, regional and transcontinental trains linking 450 communities from coast to coast and north to Hudson Bay across its 12,500-kilometre route network. Winner of the 2011 Railway Association of Canada’s Safety Award, VIA transports over four million passengers annually. The demand for VIA services is growing as travellers increasingly turn to train travel as a safe, hassle-free and environmentally responsible alternative to congested roads and airports. Follow VIA on Twitter at twitter.com/via_rail. Visit VIA on Facebook at facebook.com/viarailcanada. engaging art and creative programs for children, families, youth and adults. Visit ago.net to find out more about upcoming special exhibitions, to learn about eating and shopping at the AGO, to register for programs and to buy tickets or memberships. April 26: Galleries open 10:30 am to 9 pm today.